It’s been awhile since I’ve taken a Bikram class but I’ve thought about it often in the last couple of months. I injured my ankle last Christmas and it’s taken a long time to heal during which time I’ve been lifting weights and doing Crossfit. I was good about rehabbing my ankle and didn’t push it hard for several weeks but after just one Bikram class, I wished I’d been doing yoga in addition to Crossfit. Crossfit is great for muscle building and I’ll talk more about it later but yoga, especially Bikram with the heat and extended pose holding, gets more deeply into my joints. My ankle HURT during poses like fixed firm and bow pose but the pain feels stretchy and elongating instead of impactful. 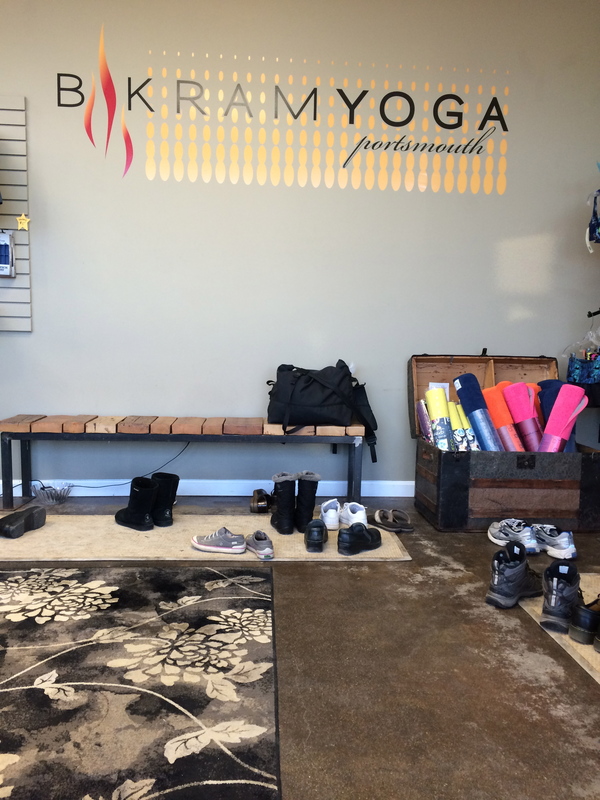 There’s no Bikram in Kennebunkport, Maine. You either have to go north to Portland, Maine or south to Portsmouth, New Hampshire. So, in the course of the last few days, I did both. Maine Hatha Yoga in Portland offers a Bikram method class without the dialogue that they call the Hot 26. My favorite yoga studio in the country also offers Bikram method classes without the Bikram dialogue and I really love it. It’s Bikram with yoga talk. Fantastic. 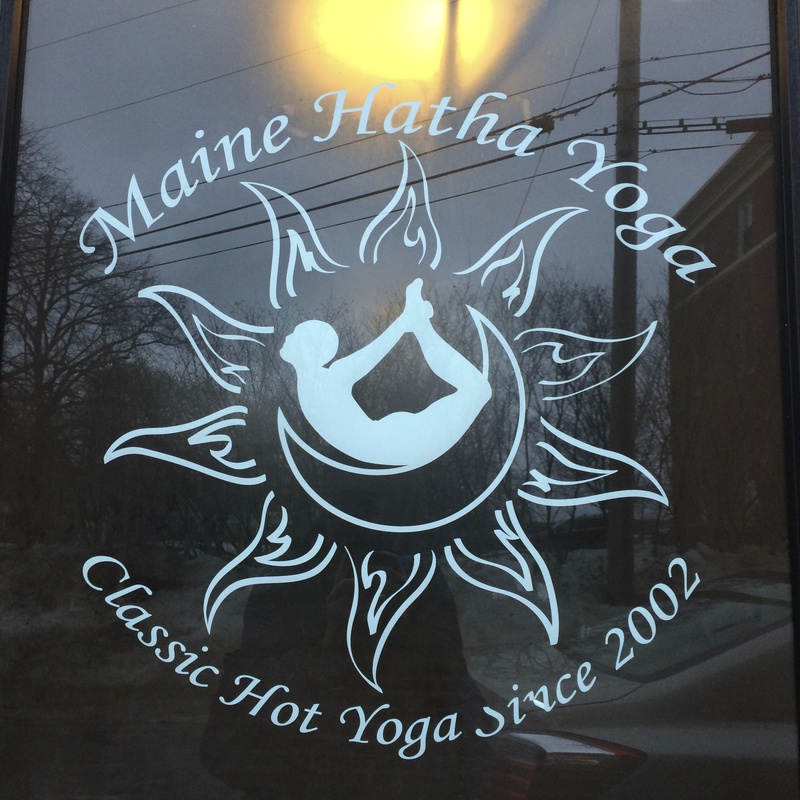 The Maine Hatha Yoga studio is small, low ceilinged and carpeted and they run the heaters and humidifiers to get the space SUPER HOT. I went to the community class on Saturday where you pay what you can afford, a lovely offering to a yoga community given how pricey Bikram can be, and the class was pretty full and REALLY INCREDIBLY HOT. My best guesstimation is somewhere around 120-130 degrees. I spent most of the class just enduring the heat and telling myself it would be over soon. Which it was. I’ve gotten better at leaning into the discomfort of heat, reminding myself that I won’t be burning up in this humid hell for all of eternity (even if it feels like it) and pushing myself to do all the poses and breathing, breathing, breathing. Non-Bikram people are right now asking themselves why I bother if it’s so awful and to them I say “because a really hot Bikram class that takes it all out of you produces an endorphin rush afterwards like no other.” It’s the most satisfying, wrung out, high flying feeling in the world. Like I climbed Everest or finished a marathon. Delicious. I feel like I’ve done something impossible that was also good for me. Deeply satisfying. I would definitely recommend this Portland studio. Good teachers and good prices. The bathroom/shower area is communal for men and women with some curtained off changing areas but everyone using all the same facilities. I thought it was very yoga spirited but if stripping in public is a deterrent for you, be warned. The studio is on the small side of average but in both classes I attended there were 50+ people in the class (!) definitely the most crowded classes I’ve ever been in. Despite that crowd the heat level was tolerable, the thermometer said 108, and there was a nice range of people from beginners to yoga competitors. The teacher, Sara, was easy on the dialogue, told lots of stories and had a lot of wise things to say. Here are a few that I’m still thinking about. 1. What kind of tone does the voice in your head have? Not what does it say, but what kind of tone does it use? WHAT KIND OF QUESTION IS THIS FOR A YOGA CLASS?? And yet, I’ve thought about it a lot. The voice in my particular head is a drill instructor. Lots of yelling and commands and very little mercy. For anything. I have to continually remind myself to be patient because I can get wrapped up in the internal yelling… I don’t think I’ve ever realized before how judgey and bossy my internal voice is. 2. Unless you’re dying, don’t skip camel. Calm in camel, calm in life. I usually skip camel the first class (or two) back to Bikram. I hate the nauseous feeling and by that point in class everything else has been so hard that I give myself a break on the last really hard thing. But this time back, I didn’t have trouble with camel. Even in the really hot Portland studio. I don’t know why this might be but I’m hoping for the “calm in life” part. 3. The kidneys can only process 24oz of liquid in 90 minutes. If you need to drink more than that, you’re just using water to make yourself feel better mentally. Trying breathing instead. 4. Challenge yourself to do hard things. That’s how you grow. Isn’t that last one the truest statement ever? So there you have it, a little science, a little encouragement and a little food for thought. The perfect Bikram happy meal. This entry was posted in Bikram, Bikram Yoga, Maine, New Hampshire, Portland ME, Sweating and tagged Bikram, Bikram yoga, bikram yoga portsmouth, hot 26, hot like crazy hot, maine, maine hatha yoga studio, New hampshire, portland, Portsmouth, seems hotter because it's cold outside, So so so so hot. Bookmark the permalink. haha! I know. I’m the worst reluctant advocate of Bikram. But if you do yoga long enough, you’ll do the camel pose. And you’ll be fine :) But I’m happy that you’re getting some yoga in your life. I’ll have to go with you when I’m next in Dallas.